Currently spay/neuter services are provided on Tuesdays and Wednesdays. For an appointment, call 630-800-2254 or email clinic@fvawl.org. Pricing for our procedures are covered within three individual categories: animal welfare organizations, low-income families and the general public. Your organization must be licensed in the state of Illinois. Any organization located out of state must have a 501(c)3 status. Illinois residents that receive Public Assistance, State Aide, Link Card, Disability, Social Security or Unemployment can qualify for our program. DuPage County residents with a LINK Card must contact DuPage County Animal Control for free spay/neuter services. †Dogs over 100 lbs will have an additional charge of $15. The general public is encouraged to use this affordable wellness care for their companion pet(s). †Dogs over 100 lbs will be have an additional charge of $20. The surgeon, Dr. Susan Brown, has over 35 years of experience as an exclusively exotic animal veterinarian and has performed well over 5400 rabbit spays and neuters. She has a special interest in small mammal care. Currently, surgeries are scheduled once a month and occasionally twice a month. Call 630-800-2254 for an appointment. Pre-surgical instructions are available on line, see our rabbit Pre-Surgical Instructions. Post surgical instruction are available on line, see our rabbit Post Surgical Instructions. For additional information on why you should spay/neuter your rabbit, see our Fix’n Facts. Limited Dental services are also provided. General dental cleaning starts at $75 for low income clients and $100 for the general public. Our veterinarian will quote other routine dental procedures at the time of exam. Additional fees for extractions and antibiotics when needed. Your animal must be spayed or neutered at the time of the dental. Our first and foremost goal is to spay and neuter animals. We do not support the unnecessary breeding of cats and dogs and do not provide discounted services to those who intentionally breed their animals or opt not to spay or neuter their pet due to personal choice. We will provide routine wellness care at our clinics, including vaccinations, heartworm test, microchips, and general wellness exams. We are not an animal hospital and do not see animals with injuries or animals that need complex exams/testing for example, such as orthopedics, allergies, or major medical issues. We do not have X-ray equipment and cannot provide services that require extensive testing and diagnostics. We also do not provide euthanasia services. We can provide basic routine services in conjunction with your pet’s spay or neuter but recommend that you have a regular veterinarian hospital for all other services. Clinical Services include all vaccines and diagnostics. Services include healthcare check, vaccines, blood test and microchipping. These services are provided on a regular basis each month. Check the Calendar for dates and times. Please call 630-800-2254 for an appointment. 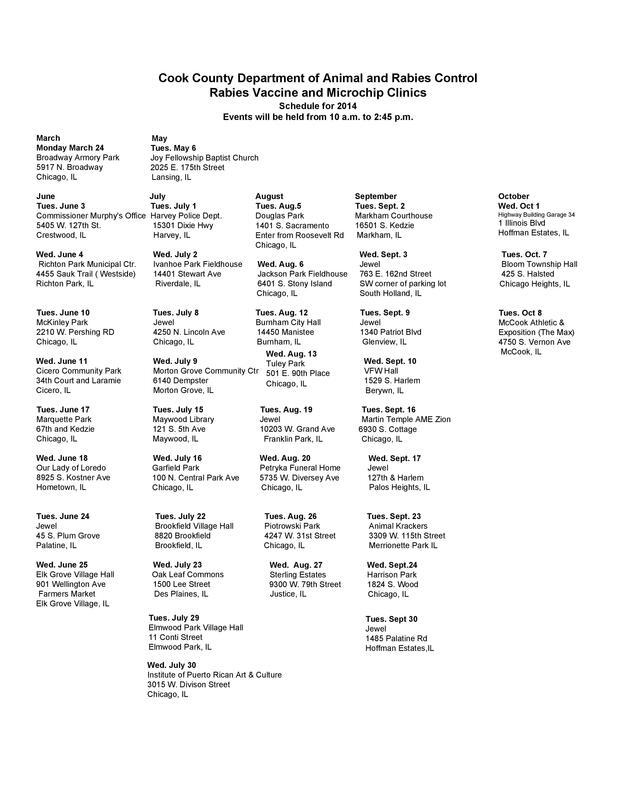 Vaccines are $10 for licensed Illinois rescue organizations and low income families. Illinois residents that receive Public Assistance, State Aide, Link Card, Disability, Social Security or Unemployment can qualify for our program. Vaccines for the general public are $15. Blood tests include Heartworm Test at $10 and Feline Combo Test at $20. 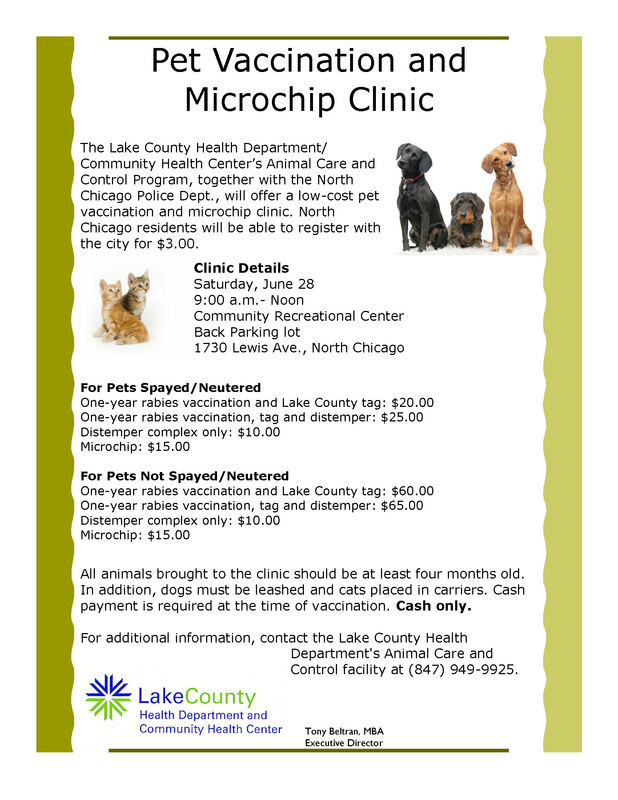 Microchips – Tell your cat or dog that you love them by insuring their safe return. By placing a microchip in your companion pet, animal control, animal shelters, clinics and rescues have access to identify your lost pet. For a $20 fee your pet will be chipped and registered directly to you, the pet owner. (No hidden fees). See the AVID brochure. Clinic operates strictly on appointments. Walk-ins are not accepted. Hours are general and subject to change based on the schedules of our medical staff. Many factors may occur that alter our schedules and it is recommended to call prior to arriving for any business matter not scheduled ahead of time. Please read the following for some important information as the following policies apply you and your pet. We believe that spay and neuter is vital to reducing the number of homeless animals on the streets and in the shelter systems. 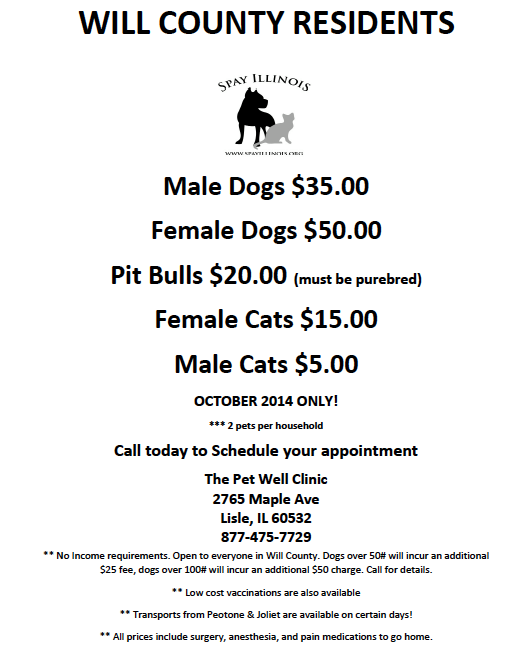 We offer low cost spay and neuter surgeries in the Animal Care League’s Clinic at 1011 Garfield, Oak Park, IL. All surgery is done by appointment and is performed by a licensed Veterinarian. Animal must be at least 4 months (16 weeks) of age. To schedule an appointment please call 708-848-8155. Animals must be dropped off on the day of surgery between 8:00am and 8:30am. Dogs are required to be on leash. Cats are required to arrive in cat carriers. Animals scheduled for Monday surgery are picked up between 2 pm and 3 pm the same day; animals scheduled for surgery on Thursday or Friday must be picked up between 3:30 pm and 4:00 pm the same day. A $50/day fee will be assessed for any animal not picked up by the required time. Payment for all services rendered by the Animal Care League are due at the time animals are DROPPED OFF at the shelter. We accept cash, personal checks with photo ID, and Visa, MasterCard, or Discover. Due to the increased risks associated with anesthesia, surgery, or recovery in the following pets, our clinic will not perform surgeries on dogs over 6 years of age or cats that are over ten years of age. We do not perform surgery on dogs over 75 pounds. We do not spay dogs in heat. If your dog is in heat you will be asked to reschedule your appointment. We perform spay and neuter for dogs for $110. We currently offer spay and neuter of cats for only $35 for a spay/$25 for a neuter. We require that all pets have proof that they are current on their Distemper vaccinations. The County requires that all animals are current on their rabies vaccinations. Proof of these vaccinations will be requested at the time of drop off for surgery. If your pet is not up to date, these vaccinations will be provided the day of surgery. Distemper vaccinations are $20 (DA2PP for dogs/FVRCP for cats). One year rabies vaccination is $20 and includes rabies certificate and tag. Spaying or neutering your pet before they reach sexual maturity (six months of age) has the most medical benefits. February is National Spay/Neuter month so SPAY ILLINOIS will be offering some awesome deals. For Kankakee County residents on Feb 9th & 10th we will be fixing all feral/barn cats for $5.00 each includes the rabies, ear tip and pain meds. For all Will & Cook County Residents we will have extremely low cost for pets all through the month of February $10 male cats, $20 female cats, $50 all dogs, and $20 all pit bulls. Please check our website for more information coming soon or call 877-475-7729 to schedule your appointments now for these clinics.